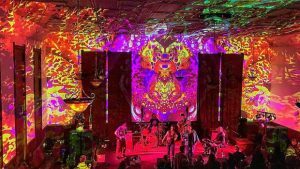 Achilles Wheel, the psychedelic jam/rockers will play the at Kentucky Mine on Aug. 25 as part of Music at the Mine summer concert series. Located just outside of the tiny hamlet known as Sierra City, 60 miles north of Nevada City on highway 49, lies the Kentucky Mine and Museum. 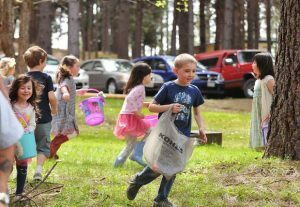 The county park, operated by the Sierra County Historical Society and open throughout the summer, features a museum, stamp mill, portal entrance to the now defunct gold mine, a shaded and spacious picnic ground and numerous mining artifacts from earlier eras. The park is also home to the Kentucky Mine Amphitheater and hosts the annual Music at the Mine summer concert series. The amphitheater is carved into the mountainside, surrounded by towering pines and oak trees and is beloved by the musicians who perform there and the patrons who are treated to wonderful and exciting concert experiences. The well maintained amphitheater seats 200 people, has a large dance floor and the natural acoustics of the venue are lauded by the performing musicians and bands. The Earles of Newtown will open the Music at the Mine Summer Concert Series at 7:30 p.m. Saturday. Interested guests are encouraged to bring their dancin’ shoes as the Earles will transport the audience to the era of swing, jazz, Dixieland and musical stylings that originated in urban America prior to the onset of World War II. Uncompromisingly authentic, the Earles fold in the music of a bygone era into the high fidelity production values of the 21st century. The band is composed of nine members, including a four piece horn section, who are masterful musicians and they showcase their formidable sound with “showmanship” and a keen sense of humor. In another time, you would have had to search for that secretive “back alley club” that required a password to gain entrance in order to experience and enjoy such a band and sound. The summer series will see the return (overwhelming demand) of the fabulous psychedelic jam/rockers, Achilles Wheel (Aug. 25) and the ever popular, Mumbo Gumbo (July 14). On Saturday night, July 28, a double bill will feature the World Beatnix and Kekoa Young & Honolulu Blue. The two bands will make for a special evening as they perform music that has its roots in Africa, Central and South America, the Middle East and the Caribbean. The Saturday performance will be a night of rhythmic intensity and soulful melodic journeys. 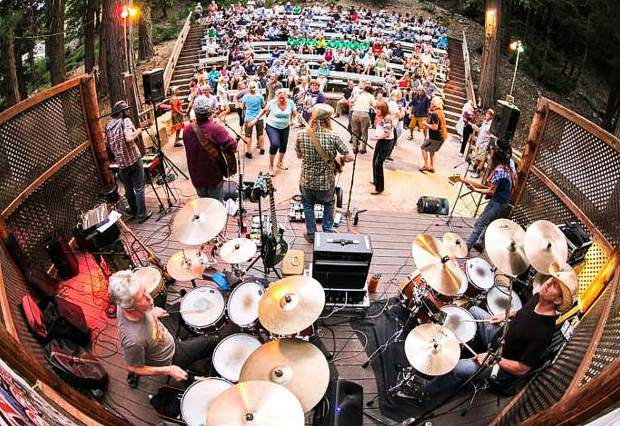 The series will conclude on Sunday afternoon, Sept. 2, with a high energy bluegrass concert featuring MerryGold and opening the show, the Nevada County All-Stars. Combined, these two bands will perform musical offerings that originated in “olde tyme” mountain music, as well as, drawing upon Cajun, gypsy, bluegrass and traditional folk music. The Red Moose Café of Sierra City will offer a pre-concert barbecue ($16) and, as always, you are welcome to bring your own food and refreshments and enjoy the shaded and spacious picnic grounds. Car pooling is highly recommended, especially for those who have a bit of a drive to return home. Guests might want to consider obtaining lodging in or near Sierra City and those options can be found by checking out the Sierra County Chamber of Commerce website, http://www.sierracountychamber.com. Campgrounds are abundant in the area, many being less than a 20 minute drive from the amphitheater, and can be located and reserved through http://www.reserveamerica.com. All shows are $22 in advance/$25 at the door. Students age 6-17 are $10 and children under 6 are free. Tickets can be purchased on-line at http://www.sierracountyhistory.org or at retail businesses throughout Sierra and Plumas counties. For information, ticket outlet locations, questions or concerns call Chris Stockdale at 530-862-1076.